Situated in Paris’s residential 16th arrondissement, Ribera Eiffel is just 350 metres from Jasmin Metro Station and a 20-minute walk to the Trocadero Gardens. 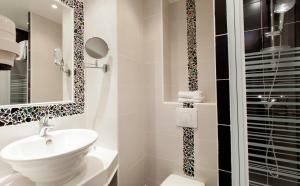 The hotel offers en suite accommodation with free Wi-Fi and lift access. The guest rooms at Ribera Eiffel are decorated in light colours and feature a fireplace. Each has a flat-screen TV with a DVD player and French cable channels. 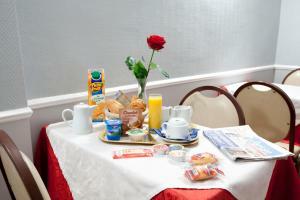 Guests can start the day with a continental breakfast every morning. Staff are available 24 hours to assist with local tours and show tickets. Airport shuttles can also be arranged for an extra fee. Roland Garros Stadium is 1.8 km from Ribera Hotel. The Eiffel Tower is 2 km away. The room features a flat-screen TV with a DVD player, a safety deposit box and a refrigerator. It also includes en suite facilities. 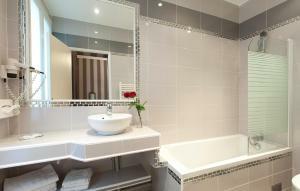 Rate: € 80.10 ... € 240.00; select dates below to get current rates. This family room features a soundproofing and fireplace.